Before I left my therapy room to work in the AT office, my classroom groups were the best part of my day. When working in self-contained special education classrooms, I typically conducted two whole class lessons twice weekly. All classroom students participated in the lessons and teachers and teacher assistants helped with behavior issues and data collection. I learned a lot from the teachers and it was really nice to see the teachers and teacher assistants implementing the language lessons throughout the school day. Today, I will write about my speech/language groups in the early childhood classrooms and in my next post, I will write about therapy in other self-contained classrooms. In the early childhood classrooms, I almost always used literature selections centered on the classroom's current lessons/theme. I focused on vocabulary and concepts that matched SLP supported language objectives. The same theme was used throughout my therapy in that classroom for at least three weeks. This theme extended into the small group and individual therapy sessions often conducted in the classroom. Books can be cost free. Use the school or public library or borrow book sets from the reading specialist’s inventory. You can also find books on-line. I looked for books that I could read such as those at We Give Books. Books read by the computer or others on YouTube don’t give the opportunities to comment, ask questions, or talk about the pictures. I always made visual supports to go with the books and other activities. Search for free graphics on the Internet or better yet, use Microsoft Office or your own pictures. I did use a lot of story props and toys in my lessons; usually bringing household items and my children’s toys from home. Before children, I visited garage sales for my toys. Below are some activities that I used in a classroom to go along with lessons about community workers and fire safety. I only used a few activities during each session and repeated activities as needed. Introduce the vocabulary by showing the PowerPoint book – Fire Fighters (click to download) or print the slides as a handout of six and cut out the slides for instant visual supports and pictures to discuss. Read Fire Truck by Peter Sis – a great book to emphasize plurals. 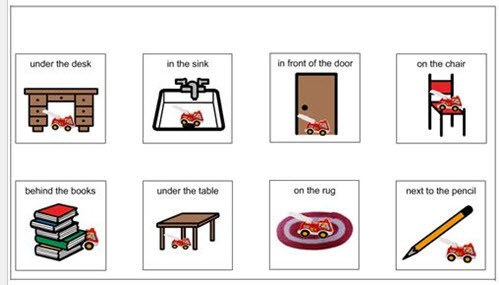 Down load this PowerPoint, Fire Truck Plurals, to make plural cards that go along with the book. Print the slides as a handout with six slides on each page. Cut out the slides to make the cards. Use cold packs to demonstrate cold and a heating pad for hot (not too hot). Show the Hot and Cold PowerPoint book as a slideshow or let the students sort the printed cards. Again, print the slides as handouts of six and cut out the slides to make cards. Using a collection of fire trucks and/or other vehicles, give each child a vehicle to move on the table. Allow the students to give directions; telling all when to go fast, go slow, or stop. 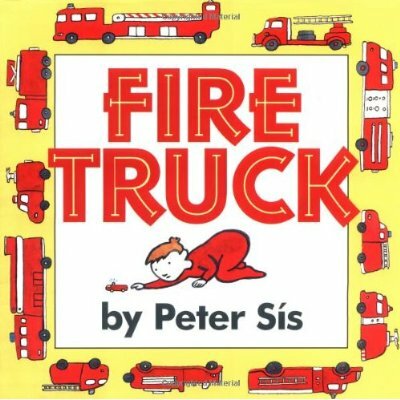 Show understanding or express prepositions while playing Where’s the Fire Truck?, a preposition activity posted at BoardmakerShare.com. You can make a similar activity by taking pictures of a fire truck at various locations in the room. Using –ing (riding, climbing, driving, eating) during pretend play. Matt had pancakes for breakfast. Have pancakes for a snack, talk about and introduce other breakfast foods. Make a cardboard ladder and a paper fire fighter figure to climb up and down the ladder. Many of these activities can be incorporated into articulation therapy; initial /f/ (fast, fire, fire truck), initial /h/ (hot), initial /k/ cold, final consonant deletion and much more. Read the interactive on-line book It’s Time to Fight a Fire at Storyplace.com and help Fran, the fire fighter, decide what to wear. To find more literature ideas with suggested goals for speech and language therapy visit books4all at all4mychild.com. And, visit the blog, Constantly Speaking, for great book lists that correlate with articulation objectives, social skills, and specific language skills. Do you conduct therapy in classrooms? If so, what suggestions do you have?